Decided to make a bulgur salad, as that’s the grain we have in the house. I was looking for something different, then the usual Tabbouleh it’s used in. I looked around the interwebs, and in the end saw one that caught my eye. I just took the idea, of the recipe, and made it my own though. 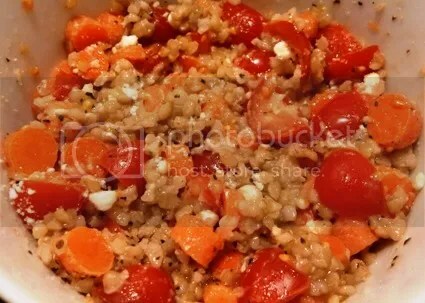 I started with cooked course bulgur, added grape tomatoes, carrots, feta cheese, olive oil, balsamic vinegar, black pepper and garlic pepper. I mixed it all together and voila 🙂 It turned out really yummy, so I’ll definitely make it again! !